Adapting our extensive post-tensioning experience to the specialised construction of tanks and silos, SRG Global has developed a single-contractor solution for customers seeking safe but cost-competitive fabrication. Our innovative concrete design and construction techniques can be adapted to steel or glass infused tanks, including cryogenic tanks. For clients with existing structures that need reinforcement or strengthening, we offer a range of SRG Global products and materials, expertly applied by our own teams. The slipform technique for silo and tank construction is a rapid and economical method that can achieve considerable cost savings when compared with the cost of conventional formwork. 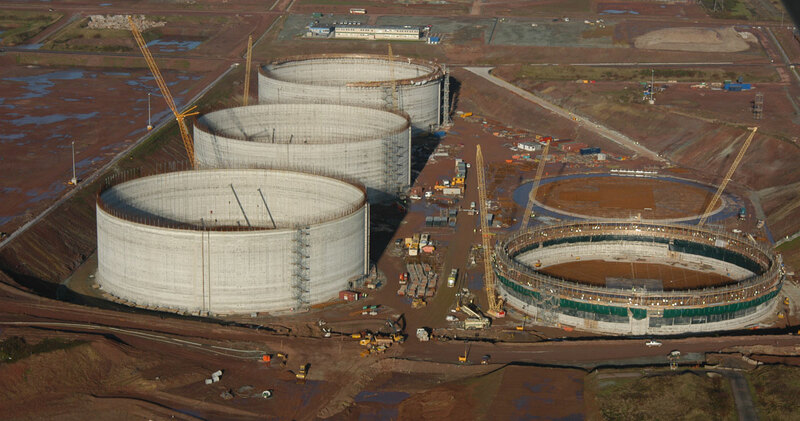 SRG Global has extensive experience in the slipform construction of tanks and silos throughout Australia and internationally. SRG Global has been designing and installing post-tensioning for tanks and silos, including cryogenic containment structures since 1982. Our inovative design, advanced construction techniques, effective project management skills and previous track record of projects make SRG Global a leader in post-tensioning for these structures across the world.